Directions to Stop #1: Get in your car and turn around so that you are headed south, back toward 63rd Street. Turn right (West) onto 63rd Street and drive about 0.5 miles and make a right (North) turn onto Manchester Trafficway. Follow Manchester Trafficway for approximately 0.3 miles and turn right (East) onto 60th Street. Drive for about 0.1 miles to the end of the street. The concrete marker for the Byram's Ford Historic District will be on your left. 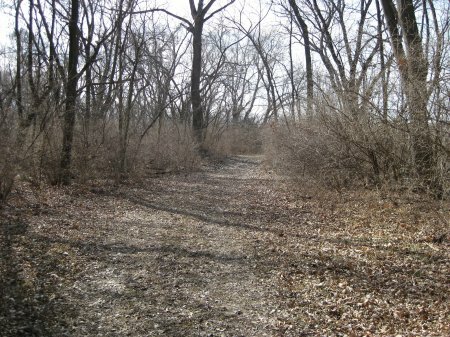 There will be a path heading east that you can follow down to Byram's Ford on west bank of the Big Blue River. This tour stop is located in Kansas City, Missouri 64132. 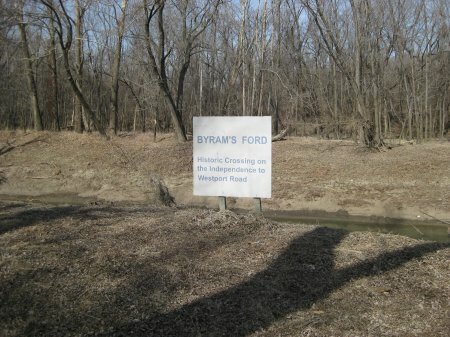 Description: The first stop on the tour places you at the place where the Byram's Ford road crossed the Big Blue River. You are now standing on the west bank of the Big Blue River at Byram's Ford. You are standing near where attackers, having just crossed the river, would have to advance up the steep river banks while under heavy fire from the defenders. This was the scene for two engagements, one on October 22 and another on October 23, 1864.